Today is Maundy Thursday in the Christian calendar. Tonight Christians around the world will be re-creating the Passover meal celebrated by Jesus with his disciples shortly before his death. The complicating factor though is that the Passover Seder meal celebrated by Jewish people today was developed after the destruction of the temple in Jerusalem. 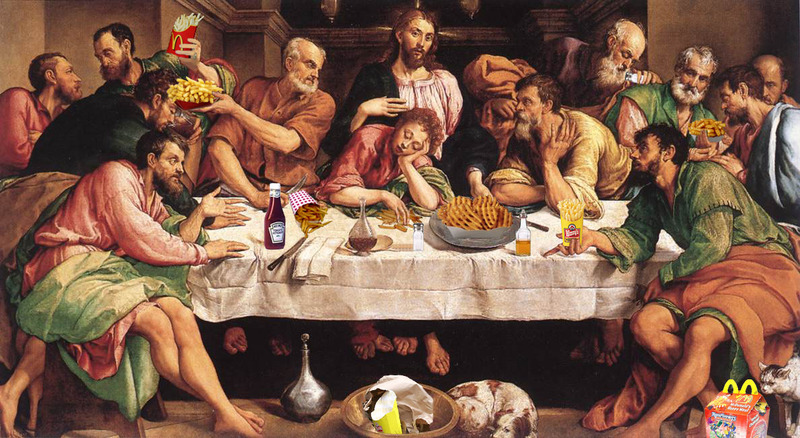 It was a refinement of the meal that Jesus celebrated. And so many members of the Jewish community are not impressed with the ‘Christianization’ of their culture. In turn, the Christian community as a whole is not overly impressed when the advertising world adopts the Last Supper for its own ends. Accusations of sacrilege and blasphemy start appearing. Of course what we’re talking about is the mutation of well known works of art such as Leonardo Da Vinci’s mural, The Last Supper. These works of art have taken on such religious significance that they themselves have become sacred. The Last Supper, also known as “Il Cenacolo” and “L’Ultima Cena”, was painted by Da Vinci as a mural in the refectory of the convent of Santa Maria delle Grazie in Milan, Italy. He began the work in 1495 and completed it in 1498. Based on a manuscript attributed to Da Vinci, art historians name the twelve disciples in the painting, from left, as Barthomolew, James the Lesser, Andrew, Judas Iscariot, Peter, John. On the other side of Jesus are Thomas, James Major, Philip, Matthew, Jude Thaddeus and Simon the Zealot. Da Vinci follows the convention of his time of placing Jesus and his fellow guests on one side of the painting. 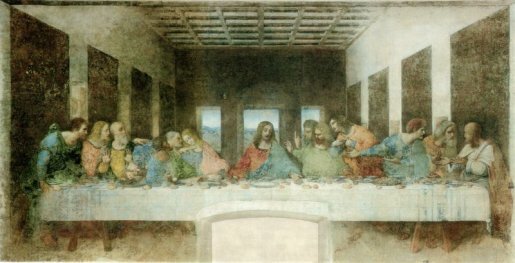 We can imagine Jesus saying to the disciples, “If you want to be in the painting you better get on this side of the table.” Da Vinci departs from religious convention by painting the thirteen men realistically, without halos. The Last Supper was painted on a dry wall and as a result deteriorated over time. In fact it was described as ruined only sixty years after its completion. There were several attempts to restore the painting over the years. The most significant restoration was done by Pinin Brambilla Barcilon between 1978 and 1999. Marithe and Francois Girbaud redesigned the Last Supper in their ad for jeans, portraying most of the diners as women in a billboard launched in March 2005, with the character of John portrayed as the only man, wearing jeans and naked from the waist up. The first response came from the city of Milan, home of the Da Vinci mural. Complainants said that the image offends the religious sensibilities of all citizens. They claimed that the advertisement trivialized the intense and dramatic moment during the Last Supper in which Christ anticipates his crucifixion in order to liberate humanity from their sins by appropriating religious symbols – such as loaves and fish – for commercial purposes and by replacing the apostles with female fashion models. Marithe and Francois Girbaud responded by saying that modern society has enabled women to achieve sexual equality with men only by sacrificing their femininity. This advertisement´s interpretation of Leonardo´s painting did not trivialize the sacred, but rather created a new perception of femininity by presenting men – instead of women – in a position of fragility. Billboards in Paris were removed after a French judge ruled that the ad campaign was offensive to Catholics, “a gratuitous and aggressive act of intrusion on people’s innermost beliefs.” Judge Jean-Claude Magendie agreed with the French Catholic Church, granting it an injunction to ban the ads. “The offence done to Catholics far outweighs the desired commercial goal,” he said. He ordered that all ads on display be taken down within three days. Anyone know who was behind this version of the Last Supper, spotted on a bus shelter in China? 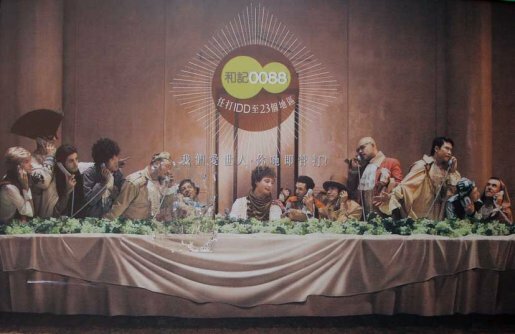 This version of Bassano’s Last Supper is more someone’s Photoshop project than an advertisement for any particular fast food chain. 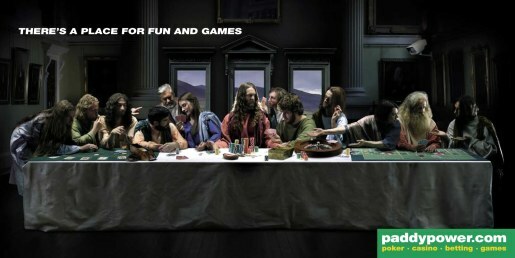 See also my post on the Paddypower Last Supper advertisement.